A brief review of ‘Windows PowerShell 4.0 for .NET Developers’, a fast-paced PowerShell guide, enabling you to efficiently administer and maintain your development environment. 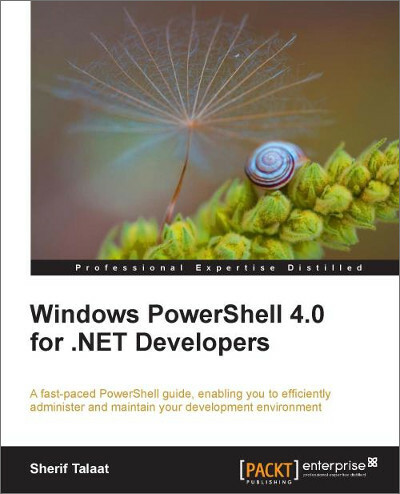 Recently, I had the opportunity to review ‘Windows PowerShell 4.0 for .NET Developers‘, published by Packt Publishing. According to its author, Sherif Talaat, the book is ‘a fast-paced PowerShell guide, enabling you to efficiently administer and maintain your development environment.‘ Working in a large and complex software development organization, technologies such as PowerShell, which enable increased speed and automation, are essential to our success. Having used PowerShell on a regular basis as a .NET developer for the past few years, I was excited to see what Sherif’s newest book offered. To test the book’s samples, I provisioned a fresh VM, and using my MSDN subscription, installed the required Windows Server, SQL Server, and Team Foundation Server. I worked directly on the VM, as well as remotely from a Windows 7 Enterprise-based development machine with Visual Studio 2012 installed. The code samples worked fairly well, with only a few minor problems I found. There is still no errata published for the book as of the time of review. A key aspect many authors do not address, is the complexities of using PowerShell in a corporate environment. Working individually or on a small network, developers don’t always experience the added burden of restrictive network security, LDAP, proxy servers, proxy authentication, XML gateways, firewalls, and centralized computer administration. Any code that requires access to remote servers and systems, often requires additional coding to work within a corporate environment. It can be frustrating to debug and extend simple examples to work successfully within an enterprise setting. Chapter 1 provides a brief introduction to PowerShell. At a scant 30 pages, I would not recommend this book as a way to learn PowerShell for the beginner. For learning PowerShell, I recommend Instant Windows PowerShell, by Vinith Menon, also published by Packt Publishing. Alternatively, I recommend a few books by Manning Publications, including Learn Windows PowerShell in a Month of Lunches, Second Edition. Chapter 2 discusses PowerShell in relationship to several key Microsoft technologies, including Windows Management Instrumentation (WMI), Common Information Model (CIM), Component Object Model (COM) and Extensible Markup Language (XML). As a .NET developer, it’s almost impossible not to have worked with one, or all of these technologies. Chapter 2 discusses how PowerShell works with .NET objects, and extend the .NET framework. The chapter also includes an easy-to-follow example of creating, importing, and calling a PowerShell binary module (compiled .NET class library), using Visual Studio. Chapter 3 explores areas where .NET developer can start leveraging PowerShell for daily administrative tasks. In particular, I found the sections on PowerShell Remoting and administering IIS and SQL Server particularly useful. Being able to easily connect to remote web, application, and database servers from the command line (or, PowerShell prompt) and do basic system administration is a huge time savings in an agile development environment. Chapters 4 focuses on how PowerShell interfaces with SOAP and REST based services, web requests, and JSON. Windows Communication Foundation (WCF) based service-oriented application development has been a trend for the last few years. Being able to manage, test, and monitor SOAP and RESTful services and HTTP requests/responses is important to .NET developers. PowerShell can often quicker and easier than writing and compiling service utilities in Visual Studio, or using proprietary third-party applications. Chapter 5 is dedicated to Visual Studio Team Foundation Server (TFS), Microsoft’s end-to-end, Application Lifecycle Management (ALM) solution. Chapter 5 details the installation and use of TFS Power Tools and TFS PowerShell snap-in. Having held the roles of lead developer and Scrum Master, I have personally found some of the best uses for PowerShell in automating various aspects of TFS. Managing TFS often requires repetitive tasks, the place where PowerShell excels. You will need to explore additional resources beyond the scope of this book to really start automating TFS with PowerShell. Overall, I enjoyed the book and felt it was well worth the time to explore. I applaud Sherif for targeting a PowerShell book specifically to developers. Due to its short length, the book did leave me wanting more information on a few subjects that were barely skimmed. I also found myself expecting guidance on a few subjects the book did not touch upon, such as PowerShell for cloud-based development (Azure), test automation, and build and deployment automation. For more information on some of those subjects, I recommend Sherif’s other book, also published by Packt Publishing, PowerShell 3.0 Advanced Administration Handbook. In many enterprise-software development environments, delivering release-ready code to an Operations or Release team for deployment, as opposed to deploying the code directly, is common practice. A developer ‘kicks off’ a build of project using a build automation system like Hudson, Jenkins, CruiseControl, TeamCity, or Bamboo. The result is a set of build artifacts that are delivered and deployed as part of the release cycle. Build artifacts are logical collections of deployable code and other files, which form the application. Artifacts are often segregated by type, such as database, web code, services, configuration files, and so forth. Each type of artifact may require a different deployment methods. There are two approaches to delivering artifacts for deployment. Some organizations deliver all the artifacts from each build for deployment. Alternately, others follow a partial delivery and release model, delivering only the artifacts that contain changes since the last delivery. The entire application is not re-deployed, only what changed. This is considered by many to be a quicker and safer method of software release. The challenge of partial delivery is knowing precisely what changed since the last delivery. Almost all source control systems keep a history of changes (‘changesets’). Based on the time of the last build, a developer can check the history and decide which artifacts to deliver based on the changes. If you have daily releases, changes between deliveries are likely few. However, if your development cycle spans a few weeks or you have multiple developers working on the same project, there will likely be many changesets to examine. Figuring out what artifacts to deliver is tedious and error prone. Missing one small change out of hundreds of changes can jeopardize a whole release. Having to perform this laborious task ever few weeks myself, I was eager to automate this process! The solution is of course PowerShell and the Microsoft Team Foundation PowerShell Snap-In. Using these two tools, I was able to write a very simple script that does the work for me. If you are unfamiliar with the Team Foundation Server (TFS) snap-in, review my earlier post, Automating Task Creation in Team Foundation Server with PowerShell. That post discusses the snap-in and explains how to install on your Windows computer. Option to open the text file when the script is complete. Given the Team Project Collection path, source location, and the date range, the script returns a sorted list of all files that changed. Making sure the list is distinct is important. File may change many times over the course of a development cycle. You only want to know if the file changed. How many times the file changed, or when it changed, is irrelevant. The file list is saved to a text file, a manifest, for review. The values of the script’s variables are also included in the manifest. Unrelated Changes – Not every file that changes within the location selected is directly associated the project being deployed. There may be multiple, related projects in that location’s sub directories (child nodes). 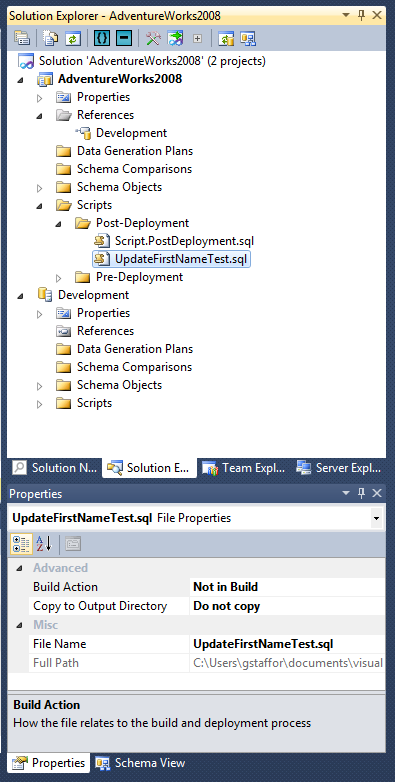 Secondary Project Files – Not every file that changes is deployed. For example, build definitions files, database publishing profiles, and manual test documents, are important parts of any project, but are not directly part of the applications within the project being deployed. 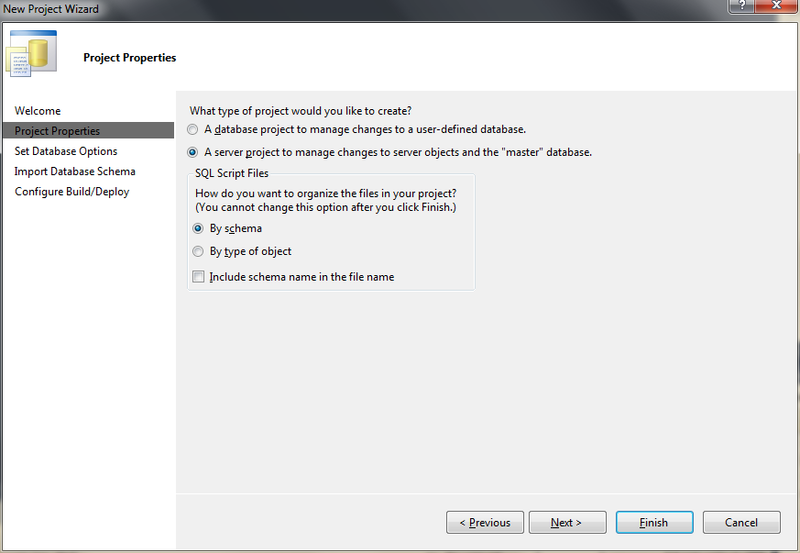 These are often files in the project used by the build system or required by TFS. Certain Change Types – Changes in TFS include several types (Microsoft.TeamFoundation.VersionControl.Client.ChangeType) that you may not want to include on the list. For example, you may not care about deleted or renamed files. See the post script about how to get a list of all ChangeTypes using PowerShell. To solve the problem of too much information, we can filter the results of the Get-TfsItemHistory command, using the Where-Object command with the Select-Object command, in the Get-TfsItemHistory command pipeline. Using the -notlike property of the Where-Object command, which accepts wildcards, we exclude certain ChangeTypes, we exclude files by name and size, and we exclude groups of files based on file path. You will obviously need to change the example’s exclusions to meet your own project’s needs. # for a given date/time range and collection location. # Write results to a manifest file. [string] $dateRange = "D2012-07-08 00:00:00Z~"
Assume you couldn’t find a resource on the web that listed all the ChangeType values? How would you use PowerShell to get a list of all the enumerated ChangeType values (Microsoft.TeamFoundation.VersionControl.Client.ChangeType)? It only takes one line of code, once the TFS plugin and assembly are loaded. 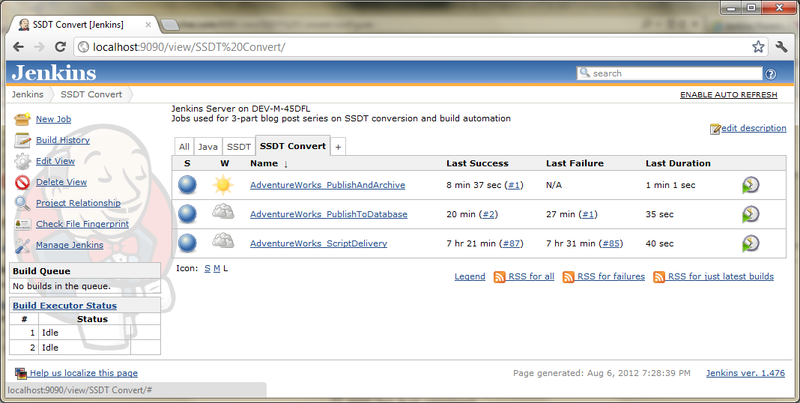 In this last post we will use Jenkins to publishing of changes from the Adventure Works SSDT database project to the Adventure Works database. Jenkins, formally Hudson, is the industry-standard, java-based open-source continuous integration server. If you are unfamiliar with Jenkins, I recommend an earlier post, Automated Deployment to GlassFish Using Jenkins and Ant. That post goes into detail on Jenkins and its associated plug-in architecture. Jenkins’ website provides excellent resources for installing and configuring Jenkins on Windows. For this post, I’ll assume that you have Jenkins installed and running as a Windows Service. 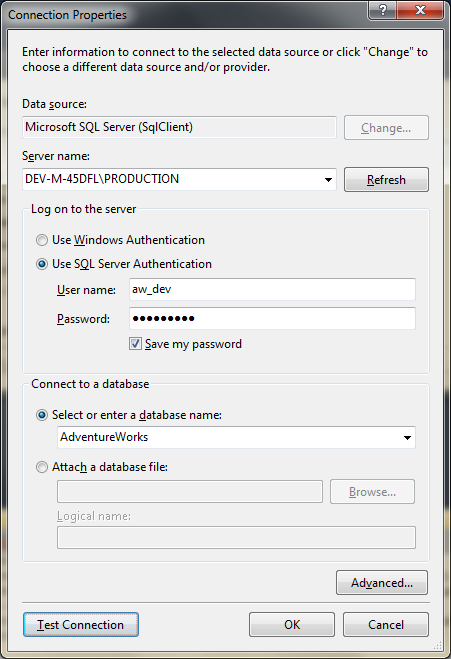 In the first two posts, we connected to the Adventure Works database with the ‘aw_dev’ SQL Server user account, using SQL Authentication. This account was used to perform schema comparisons and publish changes from the Visual Studio project. Although SQL Authentication is an acceptable means of accessing SQL Server, Windows Authentication is more common in corporate and enterprise software environments, especially where Microsoft’s Active Directory is used. Windows Authentication with Active Directory (AD) provides an easier, centralized user account security model. It is considered more secure. 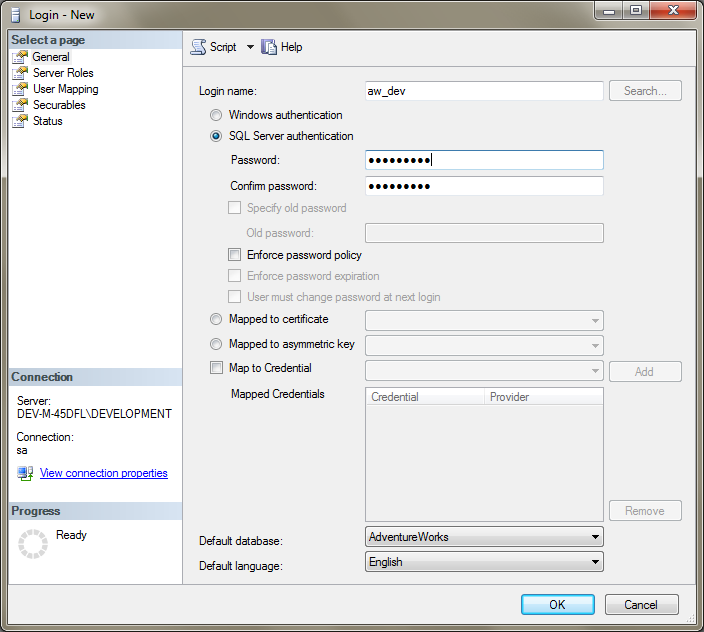 With Windows Authentication, we associate a SQL Server Login with an existing Windows user account. The account may be local to the SQL Server or part of an Active Directory domain. For this post, instead using SQL Authentication, passing the ‘aw_dev’ user’s credentials to SQL Server in database project’s connection strings, we will switch to Windows Authentication. Using Windows Authentication will allow Jenkins to connect directly to SQL Server. Create a new ‘jenkins’ Windows user account. Change the Jenkins Windows service Log On account to the ‘jenkins’ Windows account. Create a new ‘jenkins’ SQL Server Login, associated with the ‘jenkins’ Windows user account, using Windows Authentication. 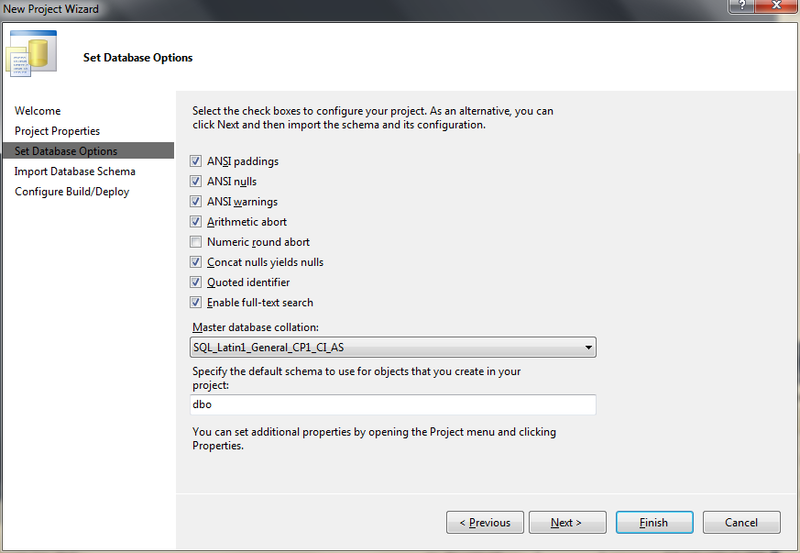 Provide privileges in SQL Server to the ‘jenkins’ user identical to the ‘aw_dev’ user. Change the connection strings in the publishing profiles to use Windows Authentication. First, create the ‘jenkins’ Windows user account on the computer where you have SQL Server and Jenkins installed. If they are on separate computers, then you will need to install the account on both computers, or use Active Directory. For this demonstration, I have both SQL Server and Jenkins installed on the same computer. 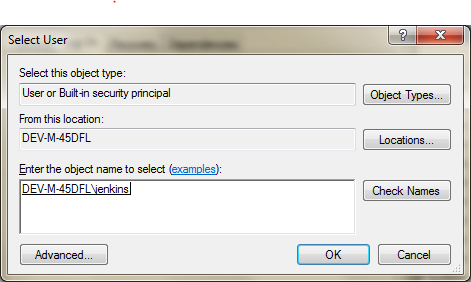 I gave the ‘jenkins’ user administrative-level rights on my machine, by assigning it to the Administrators group. 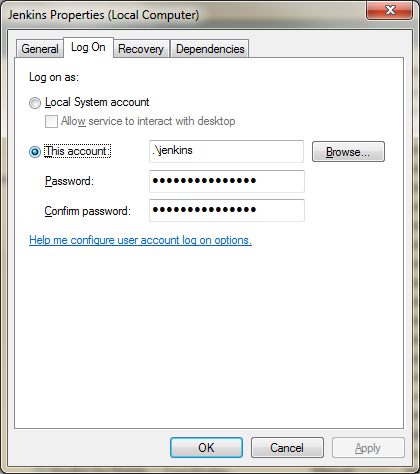 Next, change the ‘Log On’ Windows user account for the Jenkins Windows service to the ‘jenkins’ Windows user account. Restart the Jenkins Windows service to apply the change. If the service fails to restart, it is likely you did not give enough rights to the user. I suggest adding the user to the Administrators group, to check if the problem you have encountering is permissions-related. Next, to use Windows Authentication with SQL Server, create a new ‘jenkins’ Login for the Production instance of SQL Server and it with the ‘jenkins’ Windows user account. 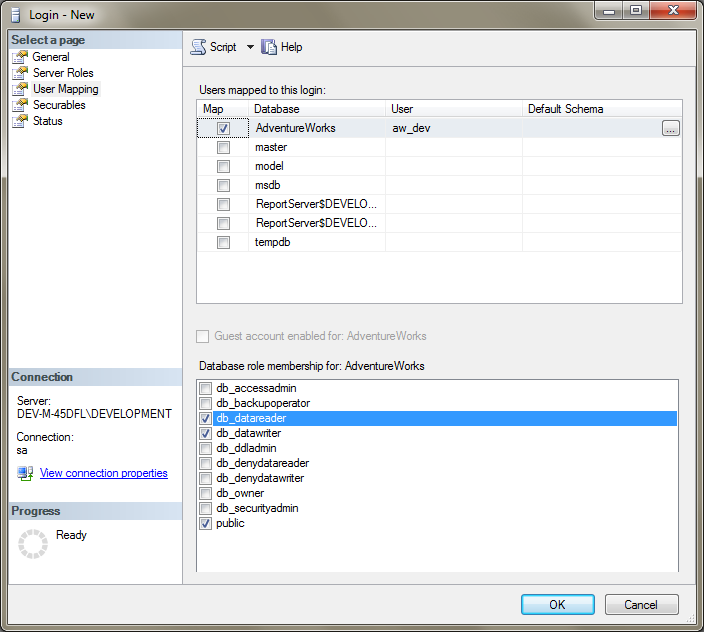 Replicate the ‘aw_dev’ SQL user’s various permissions for the ‘jenkins’ user. The ‘jenkins’ account will be performing similar tasks to ‘aw_dev’, but this time initiated by Jenkins, not Visual Studio. 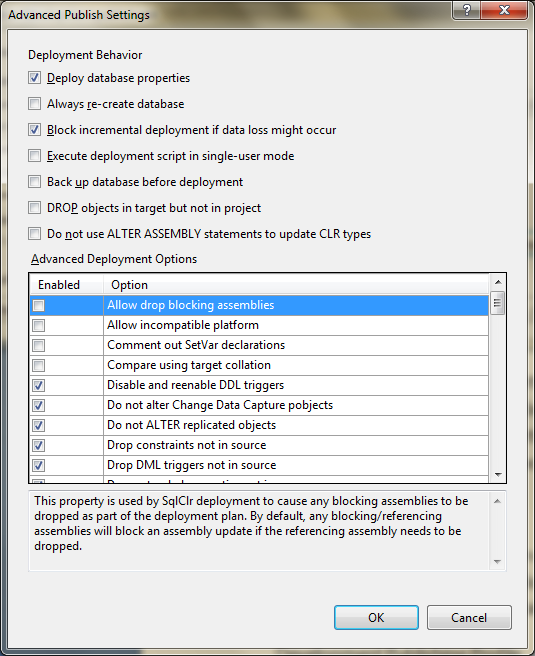 Repeat this process for the Development instance of SQL Server. In Visual Studio, switch the connection strings in the Development and Production publishing profiles in both the server project and database projects to Windows Authentication with Integrated Security. They should look similar to the code below. Substitute your server name and SQL instance for each profile. Important note here, once you switch the profile’s connection string to Windows Authentication, the Windows user account that you logged into your computer with, is the account that Visual Studio will now user to connect to the database. Make sure your Windows user account has at least the same level of permissions as the ‘aw_dev’ and ‘jenkins’ accounts. As a developer, you would likely have greater permissions than these two accounts. In many production environments, delivering or ‘turning over’ release-ready code to another team for deployment, as opposed to deploying the code directly, is common practice. A developer starts or ‘kicks off a build’ of the job in Jenkins, which generates artifact(s). Artifacts are usually logical collections of deployable code and other associated components and files, constituting the application being built. Artifacts are often separated by type, such as database, web, Windows services, web services, configuration files, and so forth. Each type may be deployed by a different team or to a different location. Our project will only have one artifact to deliver, the sql change script. This first Jenkins job we create will just generate the change script, which will then be delivered to a specific remote location for later release. We start by creating what Jenkins refers to as a parameterized build job. It allows us to pass parameters to each build of our job. We pass the name of the configuration (same as our environment name) we want our build to target. With this single parameter, ‘TARGET_ENVIRONMENT’, we can use a single Jenkins job to target any environment we have configured by simply passing its name to the build; a very powerful, time-saving feature of Jenkins. Copy the Solution from its current location to the Jenkins job’s workspace. Accept the target environment as a parameterized build parameter (ex. ‘Production’ or ‘Development’). 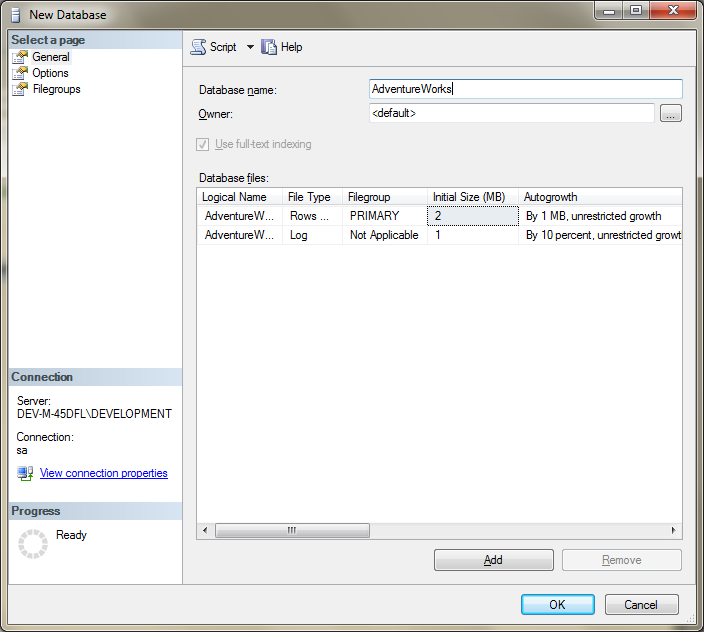 Build the database project and its dependencies based on the environment parameter. 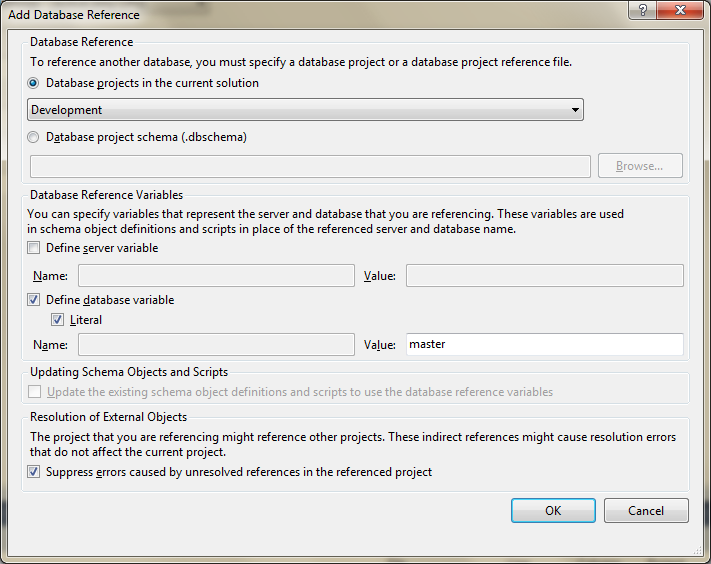 Generate the sql change script based on the environment parameter. 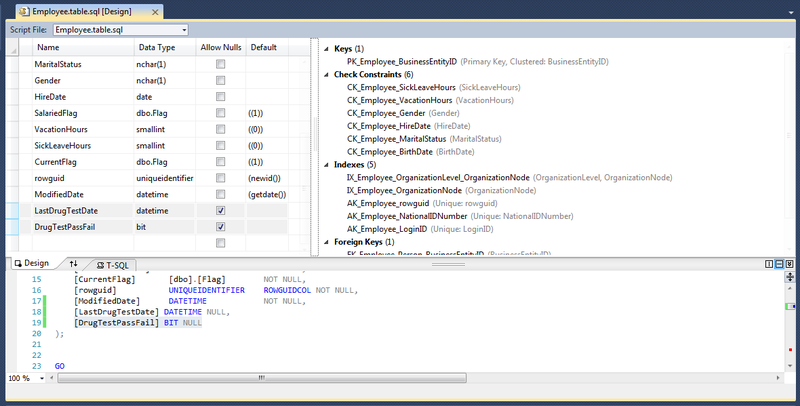 Compress and name the sql change script based on the environment parameter and build id. Deliver the compressed script artifact to a designated release location for deployment. Notify release team that the artifact is ready for release. I am not using a revision control system, such as TFS or Subversion, for our example. 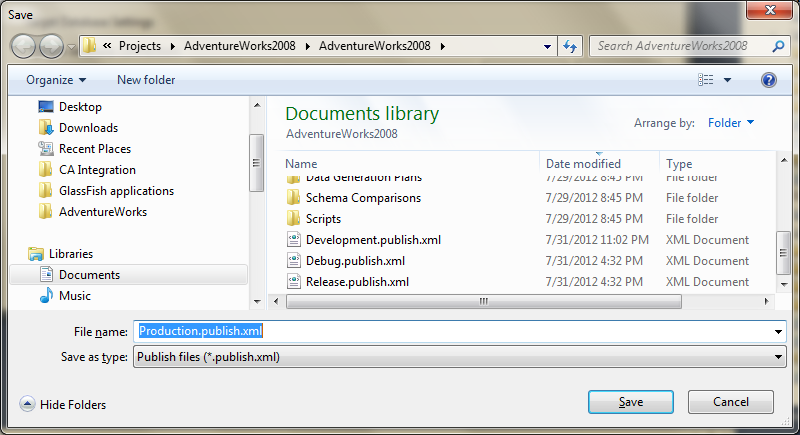 The Adventure Works Solution resides in a file directory, on my development machine. To copy the entire Solution from its current location into job’s workspace, we add a step in the Jenkins job to execute a simple xcopy command. With source control, you would replace the xcopy step with a similar step to retrieve the project from a specific branch)within the revision control system, using one of many Jenkins’ revision control plug-ins. Excluding Solution files from Jenkins job’s workspace that are unnecessary for the job to succeed is good practice. Excluding files saves time during the xcopy and can make troubleshooting build problems easier. To exclude unneeded Solution files, use the xcopy command’s ‘exclude’ parameter. To use exclude, we must first create an exclude text file, listing the directories we don’t need copied, and call it using with the exclude parameter with the xcopy command. Make sure to change the path shown above to reflect the location and name of your exclude file. Here is a list of the directories I chose to exclude. They are either unused by the build, or created as part of the build, for example the sql directories and there subdirectories. Once the Solution’s files are copied into the Jenkins job’s workspace, we perform a build of the database project with an MSBuild build step, using the Jenkins MSBuild Plug-in. 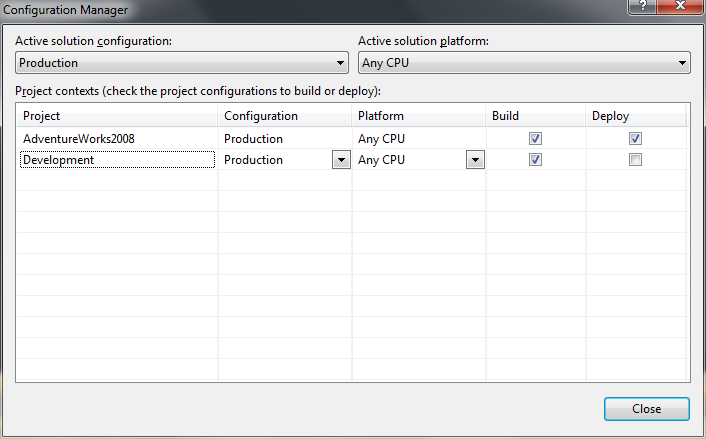 Jenkins executes the same MSBuild command Visual Studio would execute to build the project. Jenkins calls MSBuild, which in turn calls the MSBuild ‘Build’ target with parameters that specify the Solution configuration and platform to target. After Building the database project, in the same step as the build, we perform a publish of the database project. 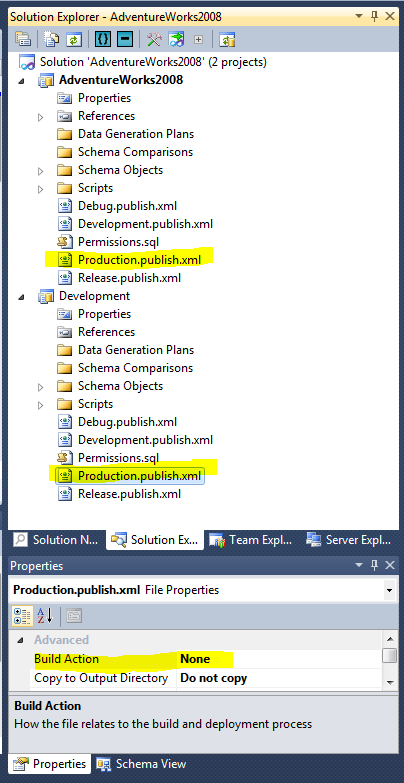 MSBuild calls the new SSDT’s ‘Publish’ target with parameters that specify the Solution configuration, target platform, publishing profile to use, and whether to only generate a sql change script, or publish the project’s changes directly to the database. In this first example, we are only generating a script. Note the use of the build parameter (%TARGET_ENVIRONMENT%) and environmental variables (%WORKSPACE%) in the MSBuild command. Again, a very powerful feature of Jenkins. To streamline the delivery, we will add a step to compress the change script using Jenkins Apache Ant Plug-in. Many consider Ant strictly a build tool for Java development. To the contrary, there are many tasks that can be automated for .NET developers with Ant. One particularly nice feature of Ant is its built-in support for zip compression. The Ant plug-in calls Ant, which in turn calls an Ant buildfile, passing it the properties we give. First, create an Ant buildfile with a single task to zip the change script. To avoid confusion during release, Ant will also append the configuration name and unique Jenkins job build number to the filename. 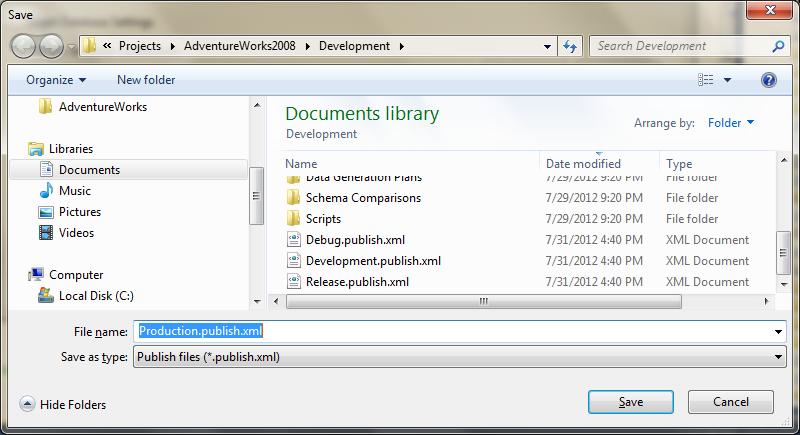 For example, ‘AdventureWorks.publish.sql’ becomes ‘AdventureWorks_Production_123_publish.zip’. 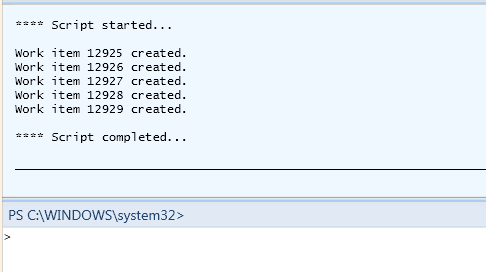 This is accomplished by passing the configuration name (Jenkins parameterized build parameter) and the build number (Jenkins environmental variable), as parameters to the buildfile (shown above). The parameters, in the form of key-value-pairs, are treated as properties within the buildfile. Using Ant to zip and name the script literally took us one line of Ant code. The contents of the build.xml buildfile is shown below. Lastly, we add a step to deliver the zipped script artifact to a ‘release’ location. Ideally, another team would retrieve and execute the change script against the database. Delivering the artifact to a remote location is easily accomplished using the Jenkins Artifact Deployer Plug-in. First, if it doesn’t already exist, create the location where you will deliver the scripts. Then, ensure Jenkins has permission to manage the location’s contents. 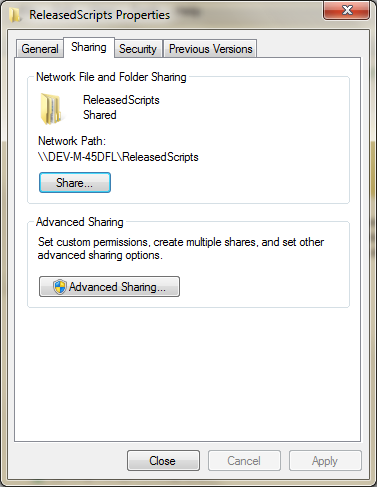 In this example, the ‘release’ location is a shared folder I created. 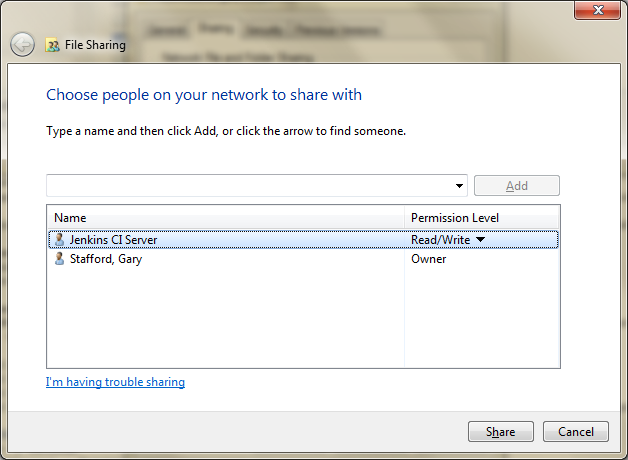 In order for Jenkins to access the ‘release’ location, give the ‘jenkins’ Windows user Read/Write (Change) permissions to the shared folder. With the deployment plug-in, you also have the option to delete the previous artifact(s) each time there is a new deployment, or leave them to accumulate. Lastly, we want to alert the right team that artifacts have been turned-over for release. There are many plug-ins Jenkins to communicate with end-users or other system. We will use the Jenkins Email Extension Plug-in to email the release team. Configuring dynamic messages to include the parameterized build parameters and Jenkins’ environmental variables is easy with this plug-in. My sample message includes several variables in the body of the message, including target environment, target database, artifact name, and Jenkins build URL. I had some trouble passing the Jenkins’ parameterized build parameter (‘TARGET_ENVIRONMENT’) to the email plug-in, until I found this post. The format required by the plug-in for the type of variable is a bit obscure as compared to Ant, MSBuild, or other plug-ins. Please contact Development for questions or problems regarding this release. As the last demonstration in this series of posts, we will publish the project changes directly to the database. Good news, we have done 95% of the work already. We merely need to copy the Jenkins job we already created, change one step, remove three others steps, and we’re publishing! Start by creating a new Jenkins job by copying the existing script delivery job. Next, drop the Invoke Ant, Artifact Deployer, and Archive Artifacts steps from the job’s configuration. 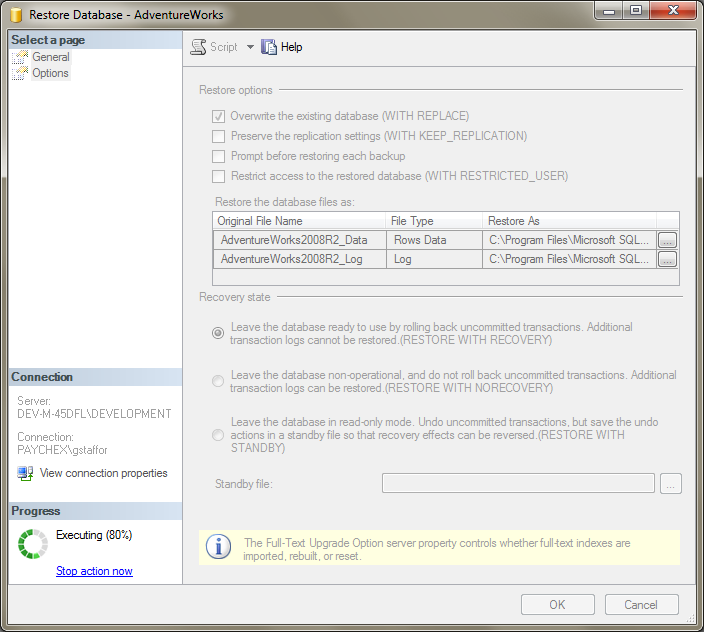 Lastly, set the last parameter of the MSBuild task, ‘UpdateDatabase’, to True from False. That’s it! Instead of creating the script, compressing it, and sending it to a location to be executed later, the changes are generated and applied to the database in a single step. If you are not comfortable with the direct approach, there is a middle ground between only generating a script and publishing directly to the database. You can keep a record of the changes made to the database as part of publishing. 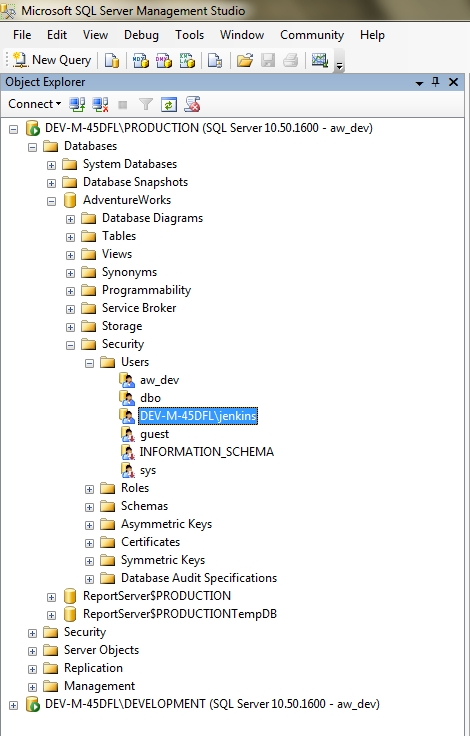 To do so, change the ‘UpdateDatabase’ parameter to True, and only drop the Artifact Deployer step; leave the Invoke Ant and Archive Artifacts steps. The resulting job generates the change script, publishes the changes to the database, and compresses and archives the script. You now have a record of the changes made to the database. In this last of three posts we demonstrated the use of Jenkins and its plug-ins to created three jobs, representing three possible SSDT publishing workflows. Using the parameterized build feature of Jenkins, each job capable of being executed against any database environment that we have a configuration and publishing profile defined for. Hopefully, one of these three workflows may fit your particular release methodology. Microsoft’s Visual Studio 2010 (VS 2010) IDE has been available to developers since April, 2010. Microsoft’s SQL Server 2008 R2 (SQL 2008 R2) has also been available since April, 2010. If you are a modern software development shop or in-house corporate development group, using the .NET technology stack, you probably use VS 2010 and SQL 2008 R2. Moreover, odds are pretty good that you’ve implemented a Visual Studio 2010 Database Project SQL Server Project to support what Microsoft terms a Database Development Life Cycle (DDLC). Now, along comes SSDT. 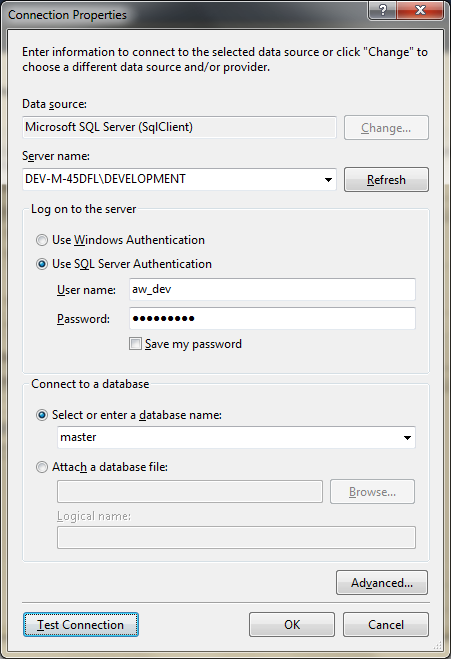 Recently, along with the release of SQL Server 2012, Microsoft released SQL Server Data Tools (SSDT). 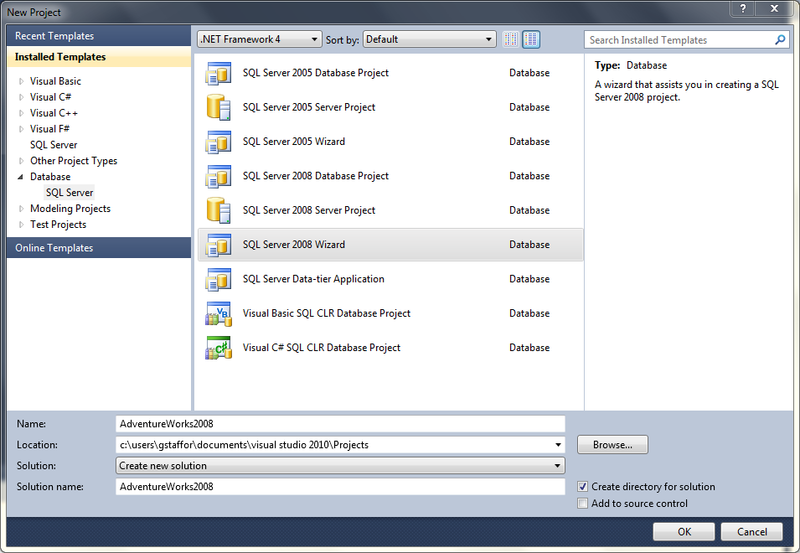 Microsoft refers to SSDT as “an evolution of the existing Visual Studio Database project type.” According to Microsoft, SSDT offers an integrated environment within Visual Studio 2010 Professional SP1 or higher for developers to carry out all their database design work for any SQL Server platform (both on and off premise). The term ‘off premises’ refers to SSDT ‘s ability to handle development in the Cloud – SQL Azure. SSDT supports all current versions of SQL Server, including SQL Server 2005, SQL Server 2008, SQL Server 2008 R2, SQL Server 2012 and SQL Azure. 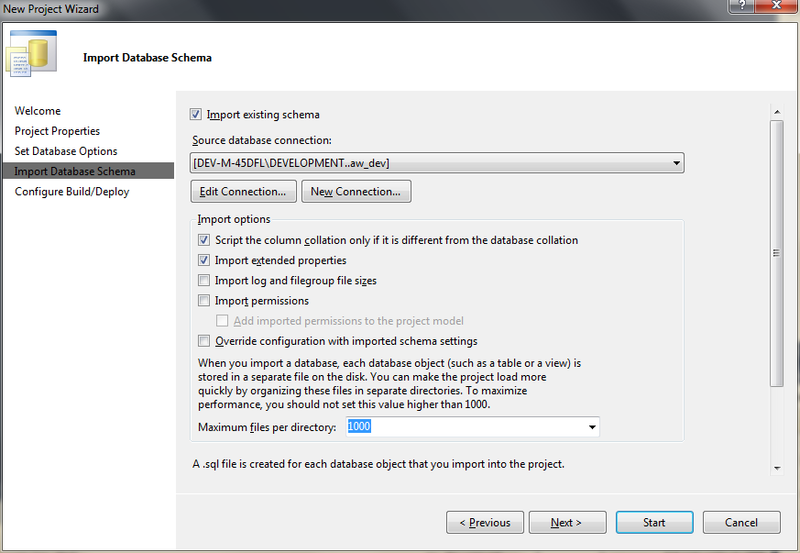 SSDT offers many advantages over the VS 2010 database project type. SSDT provides a more database-centric user-experience, similar to SQL Server Management Studio (SSMS). Anyone who has used VS 2010 database project knows the Visual Studio experience offered a less sophisticated user-interface than SSMS or similar database IDE’s, like Toad for SQL. Installing Microsoft’s free SSDT component, after making sure you have SP1 installed for VS 2010 Professional or higher, you can easily convert you VS 2010 database projects to the new SSDT project type. The conversion offers a better development and deployment experience, and prepare you for an eventual move to SQL Server 2012. To avoid learning SSDT with a copy of your client’s or company’s database, I suggest taking the same route I’ve taken in this post. 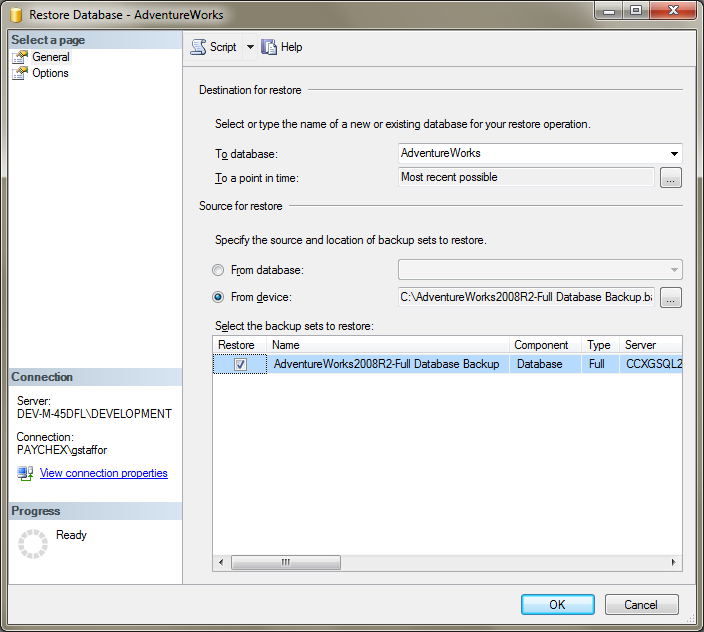 To demonstrate how to convert from a VS 2010 database project to SSDT, I am using a copy of Microsoft’s Adventure Works 2008 database. Installed, the database only takes up about 180 MBs of space, but is well designed and has enough data to use as a good training tool it, as Microsoft intended. 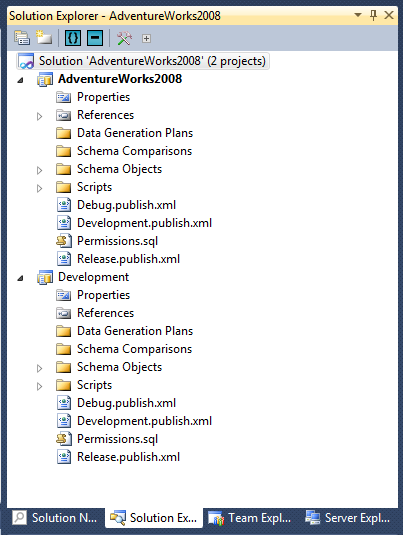 There are several version of the AdventureWorks2008 database available for download depending on your interests – OLTP, SSRS, Analysis Services, Azure, or SQL 2012. 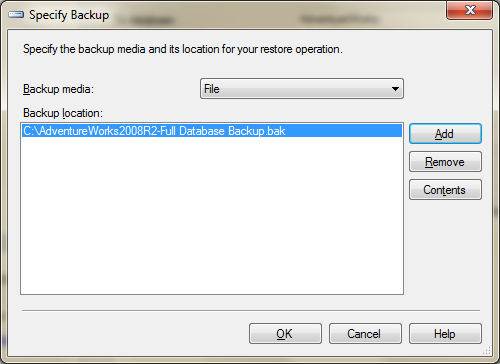 I chose to download the full database backup of the AdventureWorks2008R2 without filestream for this post. Before installing the database, I used the SQL Server Installation Center to install a new instance of SQL Server 2008 R2, which I named ‘Development’. This represents a development group’s database environment. Other environments in the software release life-cycle commonly include Testing, Staging, and Production. Each environment usually has its own servers with their own instances of SQL Server, with its own copy of the databases. Environments can also include web servers, application servers, firewalls, routers, and so forth. After installing the Development instance, I logged into it as an Administrator and created a new empty database, which I named ‘AdventureWorks’. I then restored the downloaded backup copy of Adventure Works 2008 R2, which I downloaded, to the newly created Adventure Works database. 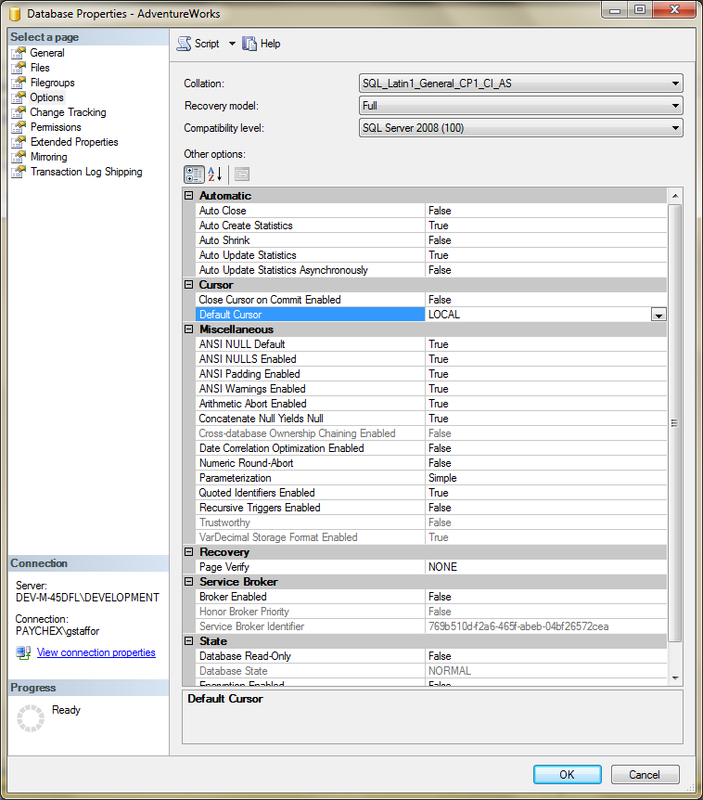 You may note some differences between the configuration settings displayed below in the screen grabs and the default configuration of the Adventure Works database. This post is not intended to recommend configuration settings for your SQL Server databases or database projects. Every company is different in the way it configures its databases. 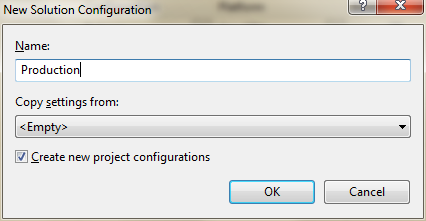 The key is to make sure that the configuration settings in your database align with the equivalent configuration settings in the database project in Visual Studio 2010. If not, when you initially publish changes to the database from the database project, the project will script the differences and change the database to align to the project. 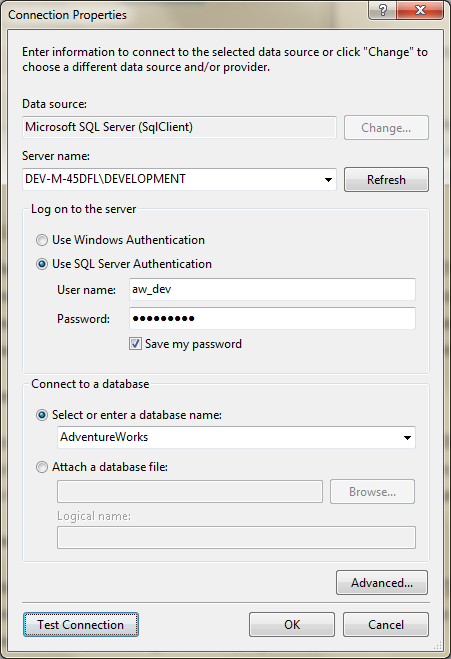 Lastly in SSMS, I added a new login account to the Development SQL Server instance and a user to the Adventure Works database, named ‘aw_dev’. 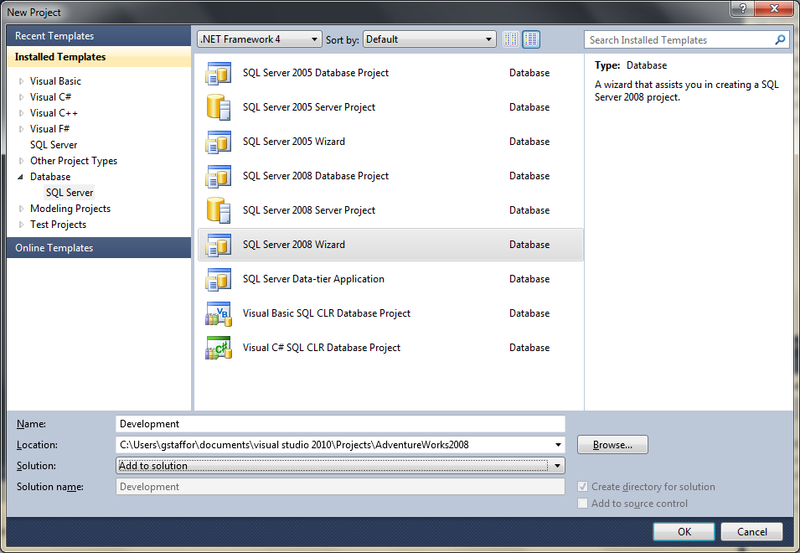 This user represents a developer who will interact with the database through the SSDT database project in VS 2010. 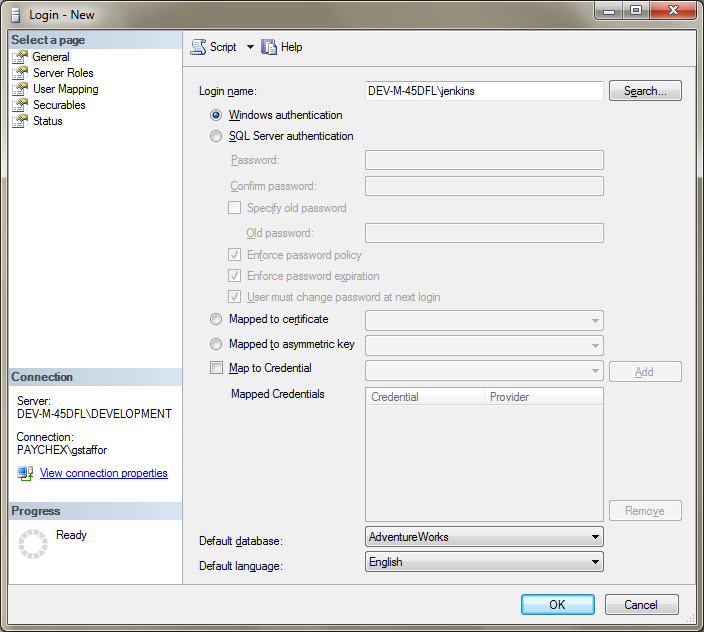 For simplicity, I used SQL authentication for this user versus Windows authentication. I gave the user the minimal permissions necessary for this example. Depending on the types of interactions you have with the database, you may need to extend the rights of the user. 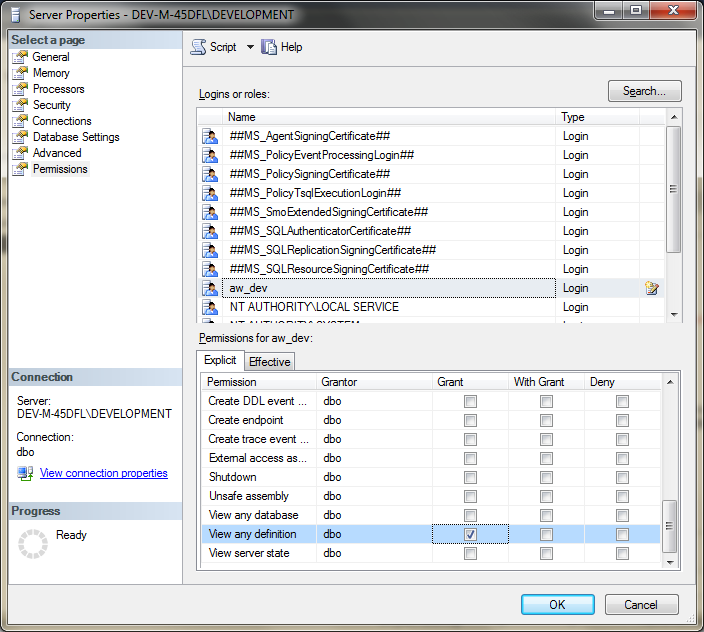 Two key, explicit permissions must be assigned for the user for SSDT to work properly. First is the ‘view any definition’ permission on the Development instance. 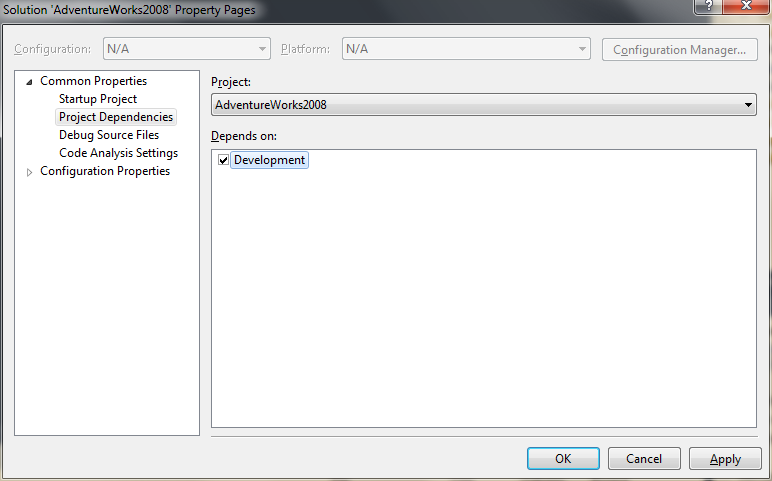 Second is the ‘view definition’ permission on the Adventure Works database. These enable the SSDT project to perform a schema comparison to the Adventure Works database, explained later in the post. Lack of the view definition permission is one of the most common errors I’ve seen during deployments. They usually occur after adding a new database environment, database, database user, or continuous integration server. 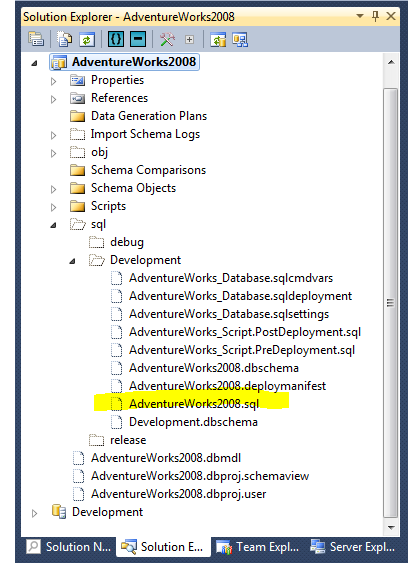 In VS 2010, I created a new SQL Server 2008 database project, named ‘AdventureWorks2008’. 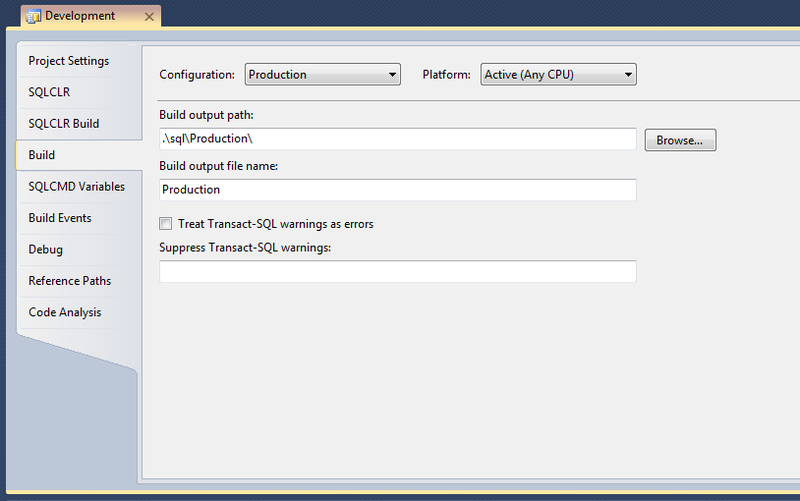 In the same Visual Studio Solution, I also created a new SQL Server 2008 server project, named ‘Development’. 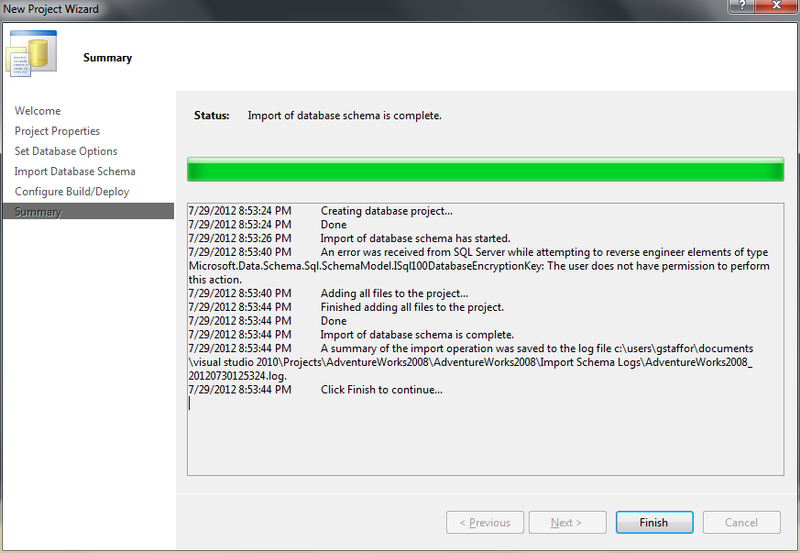 The database projects mirrors the schema of the Adventure Works database, and the server project mirrors the instance of SQL Server 2008 R2 on which the database is housed. The exact details of creating and configuring these two projects are too long for this post, but I have a set of screen grabs, hyperlinked below, to aid in creating these two projects. For the database project, I only showed the screens that are signficantly different then the server project screens to save some space. After creating both projects, I created a reference (dependency) from the Adventure Works 2008 database project to the Development server project. The database project reference to the server project creates the same parent-child relationship that exists between the Development SQL Server instance and the Adventure Works database. Once both projects are created and the reference made, your Solution should look like the second screen grab, below. Next, I created a new ‘Development’ Solution configuration. This configuration defines the build and deployment parameters for the database project when it targets the Development environment. Again, in a normal production environment, you would have several configurations, each targeting a specific database environment. In the context of this post, a database environment refers to a unique combination of servers, server instances, databases, data, and users. 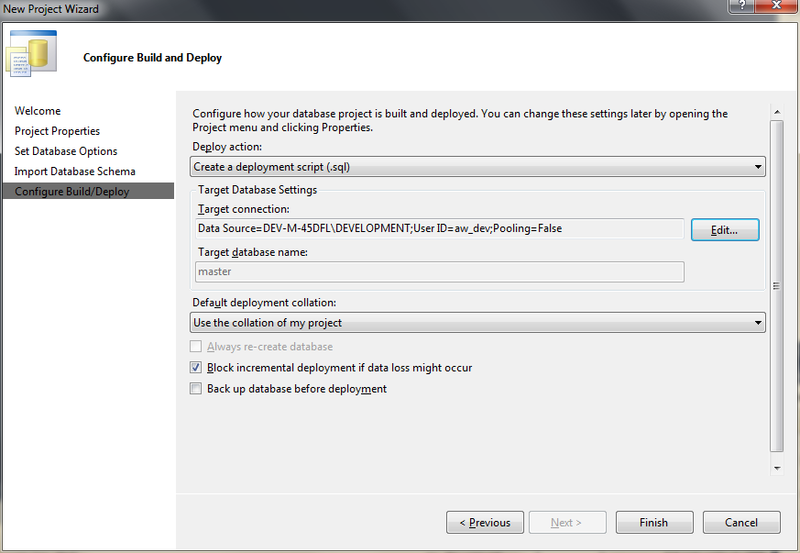 For this first example we are only setting up one database environment, Development. 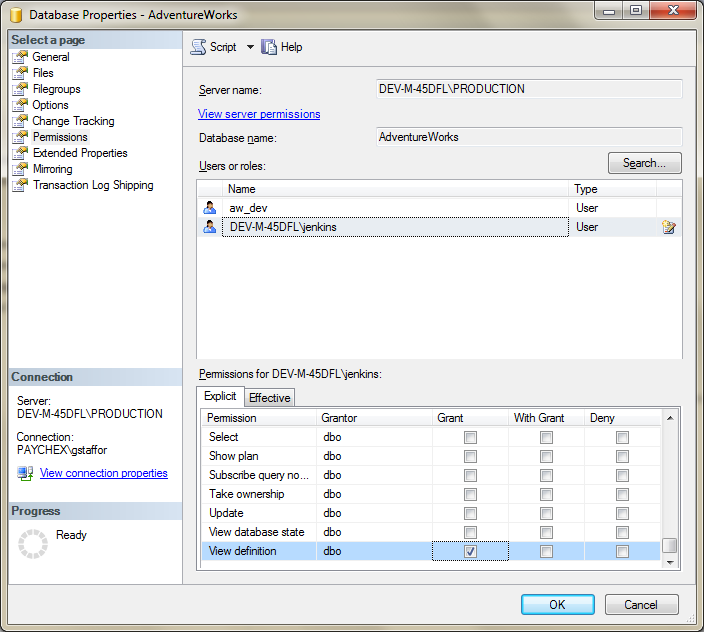 The configuration specifies the parameters specific to the Adventure Works database in the Development environment. The connection string containing the server, instance, and database names, user account, and connection parameters, are all specific to the Development environment. They are different in the other environments – Testing, Staging, and Production. Once the Development configuration was completed, I ran the ‘Rebuild’ command on the Solution, using the Development configuration, to make sure there are no errors or warnings. Next, with the Development configuration set to only create the deployment script, not to create and deploy the changes to the database, I ran the ‘Deploy’ command. 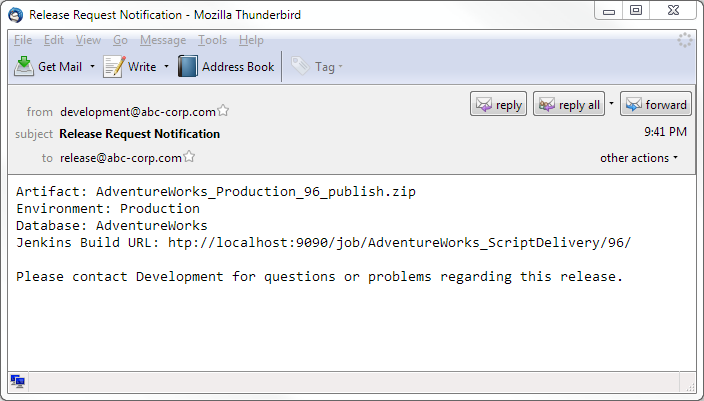 This created a deployment script, entitled ‘AdventureWorks2008.sql’, in the ‘sql\Development’ folder of the AdventureWorks2008 database project. Since I just created both the Adventure Works database and the database project, based on the database, there are no schema changes in the deployment script. You will see ‘filler’ code for error checking and so forth, but no real executable schema changes to the database are present at this point. If you do see initial changes included in the script, usually database configuration changes, I suggest modifying the settings of the database project and/or the database to align to one another. For example, you may see code in the script to change the database’s default cursor from global to local, or vice-versa. Or, you may also see code in the script to the databases recovery model from full to simple, or vice-versa. You should decide whether the project or the database is correct, and change the other one to match. If necessary, re-run the ‘Deploy’ command and re-check the deployment script. Optionally, you can always execute the script with the changes, thus changing the database to match the project, if the project settings are correct. After successfully testing the development configuration and the deployment script, making any configuration changes necessary to the project and/or the database, I then tested the project’s ability to successfully execute a Deploy command against the database. 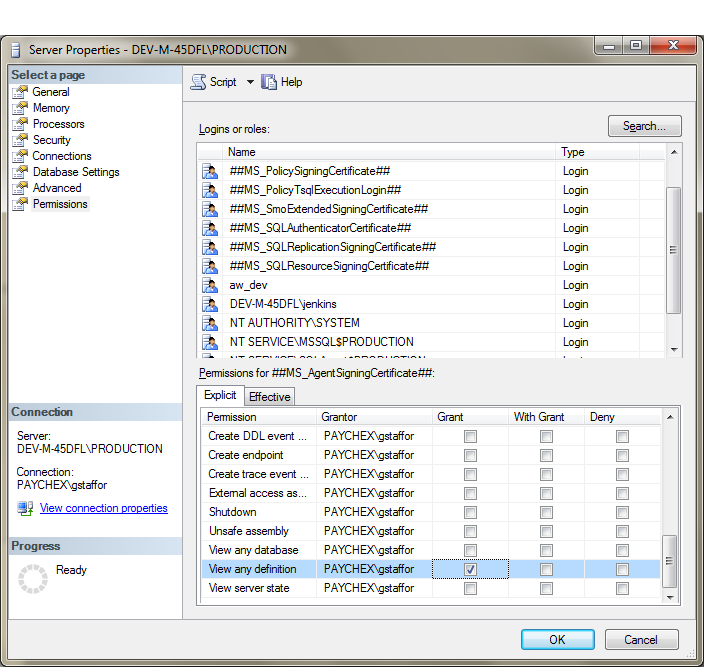 I changed the Development configuration’s deploy action from ‘create a deployment script (.sql)’ to from ‘create a deployment script (.sql) and deploy to the database’. I then ran the ‘Deploy’ command again, and this time the script is created and executed against the database. 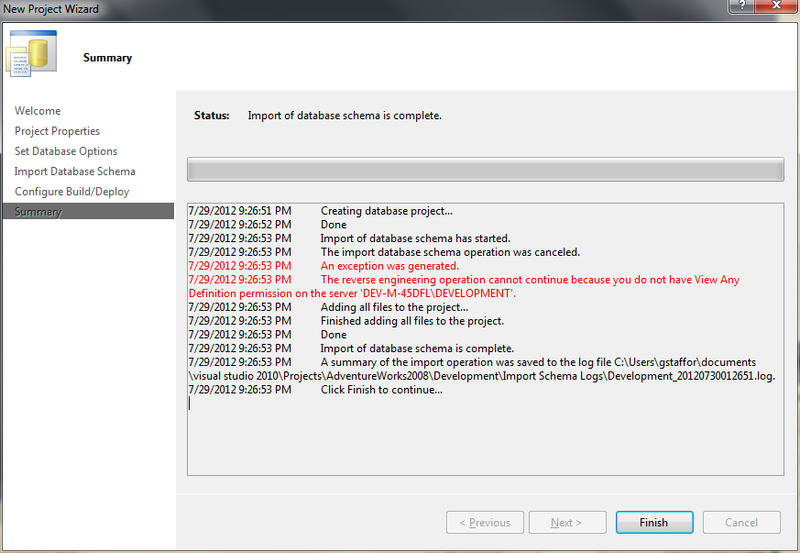 Since I still had not made any changes to the project, there were no schema changes made to the database. I just tested the project’s ability to create and deploy to the database at this point. Most errors at this stage are insufficient database user permissions (see example, below). 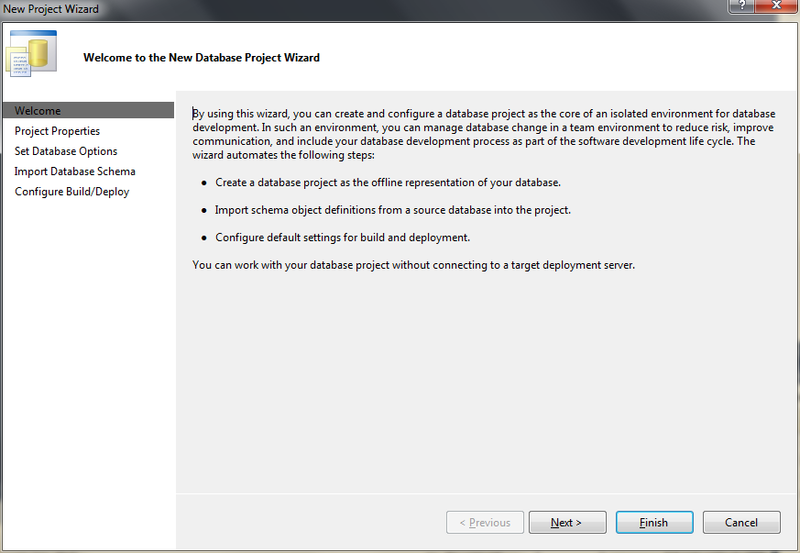 Finally, I tested the project’s ability to make changes to the database as part of the deployment. To do so, I created a simple post-deployment script that changes the first name of a single, existing employee. After adding the post-deployment script to the database project and adding the script’s path to the post-deployment script file, I again ran the ‘Deploy’ command again, still using the Development configuration. This time the deployment script contained the post-deployment script’s contents. 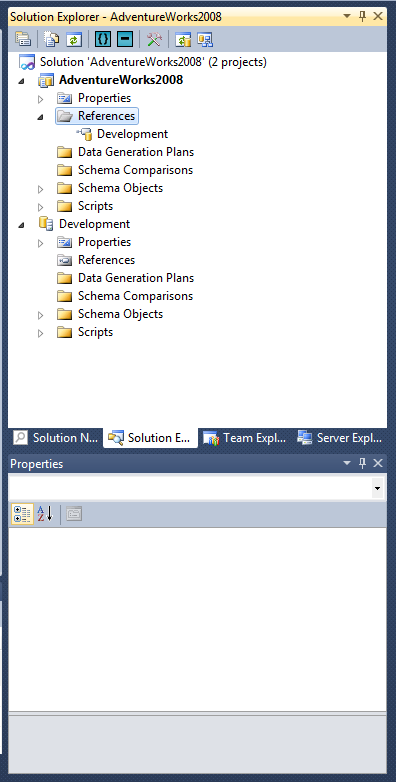 When deployed, one record was affected, as indicated in VS 2010 Output tab. 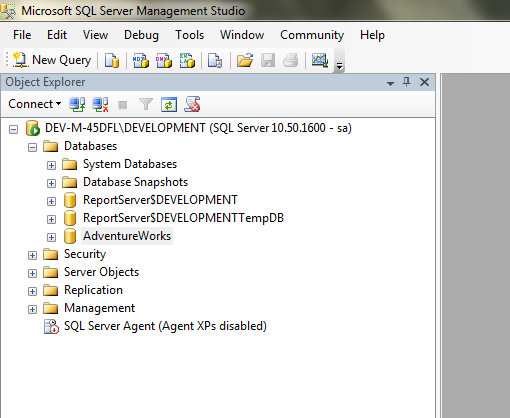 I verified the change was successful in the Adventure Works database table, using SSMS. 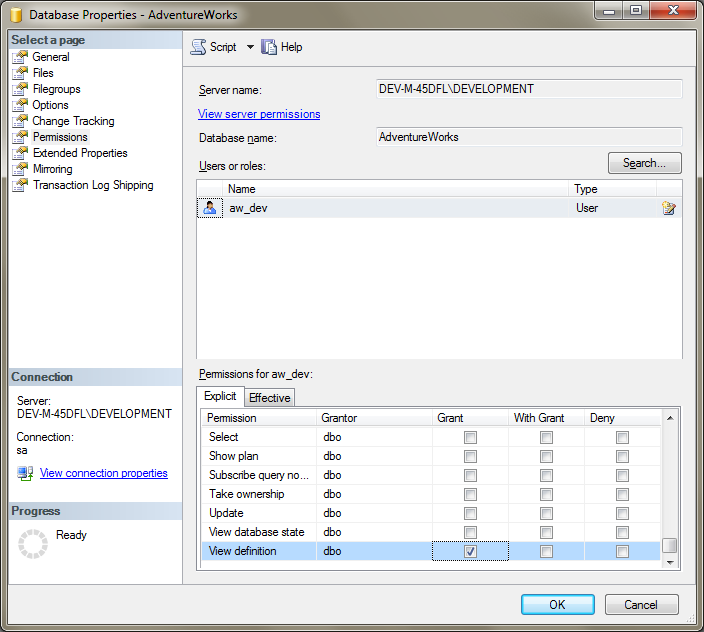 We now have a SQL Server 2008 R2 database instance representing a Development environment, and a copy of the Adventure Works database, being served from that instance. We have corresponding VS 2010 database and server projects. 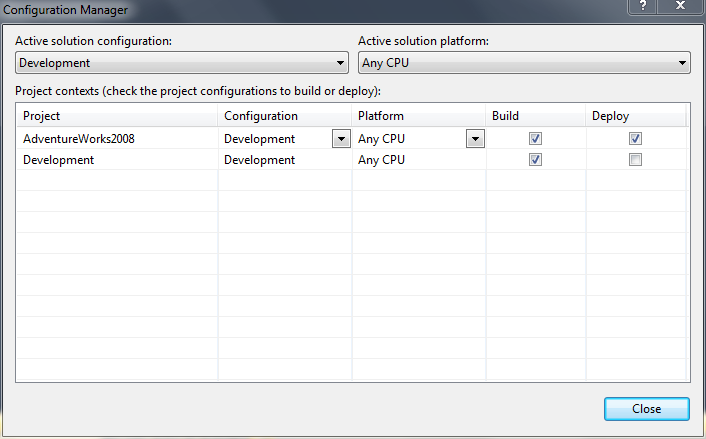 We also have a new Development Solution configuration, targeting the Development environment. Lastly, we tested the database project’s capability to successfully build and deploy a change to the database. 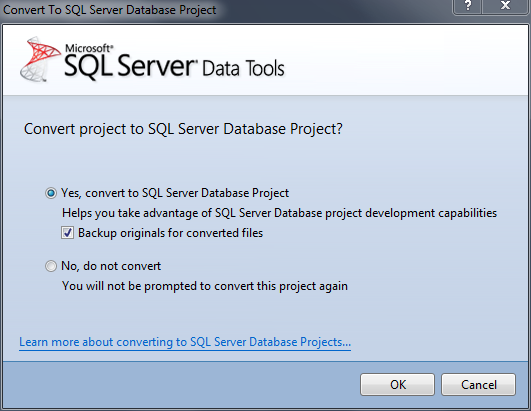 In Part II of this series, I will show how to convert the VS 2010 database and server projects to SSDT. In a previous post, Automating Task Creation in Team Foundation Server with PowerShell, I demonstrated how to automate the creation of TFS Task-type Work Items using PowerShell. After writing that post, I decided to go back and further automate my own processes. I combined two separate scripts that I use on a regular basis, one that creates the initial Change Request (CR) Work Item, and a second that creates the Task Work Items associated with the CR. Since I usually run both scripts successively and both share many of the same variables, combining the scripts made sense. I now have a single PowerShell script that will create the parent Change Request and the associated Tasks in TFS. The script reduces my overall time to create the Work Items by a few minutes for each new CR. The script also greatly reduces the risk of input errors from typing the same information multiple times in Visual Studio. The only remaining manual step is to link the Tasks to the Change Request in TFS. Similar to the previous post, for simplicity sake, I have presented a basic PowerShell script. The script could easily be optimized by wrapping the logic into a function with input parameters, further automating the process. I’ve placed a lot of comments in the script to explain what each part does, and help make customization easier. The script explicitly declares all variables, adhering to PowerShell’s Strict Mode (Set-StrictMode -Version 2.0). I feel this makes the script easier to understand and reduces the possibility of runtime errors. 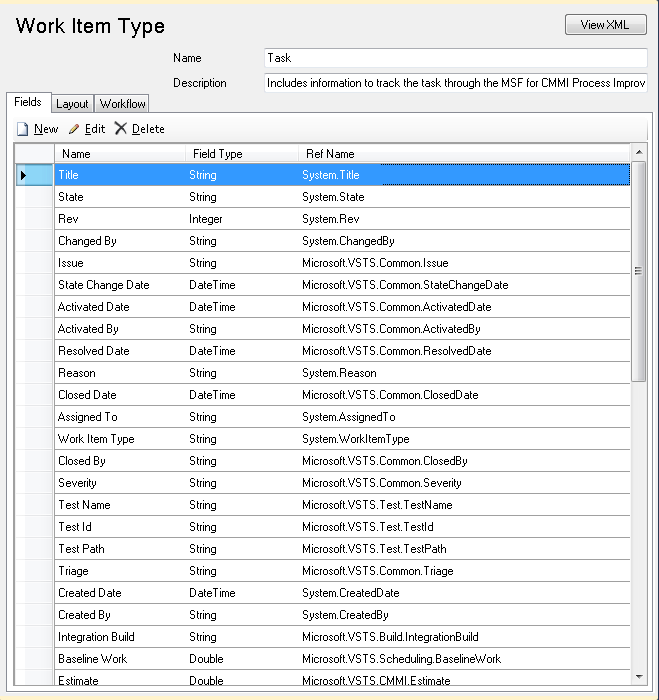 # (5) Task-type Work Items in TFS. [string] $workItemType = "Development\Change Request"
[string] $description = "Create Task Automation PowerShell Script"
[string] $requestName = "Name of CR from Service Manager"
[string] $assignee = "Doe, John"
[string] $testType = "Unit Test"
[string] $fields = "Title=$($requestName);Description=$($description);CR Id=$($crId);"
$fields += "Estimate=$($totalEstimate);Assigned To=$($assignee);Test Type=$($testType);"
$fields += "Area Path=$($areaPath);Iteration Path=$($iterationPath);Priority=$($priority);"
[string] $fields = "Title=$($taskTitle);Description=$($taskTitle);Assigned To=$($assignee);"
$fields += "Area Path=$($areaPath);Iteration Path=$($iterationPath);Discipline=$($taskDisciplineArray[$i]);Priority=$($i+1);"
$fields += "Estimate=$($taskEstimateArray[$i]);Remaining Work=$($taskEstimateArray[$i]);Completed Work=0"
$env:path += ";C:\Program Files (x86)\Microsoft Visual Studio 10.0\Common7\IDE"
First, use PowerShell to set your path environmental variable to include your local path to witadmin.exe. Then set your TFS Server path and the TFS Work Item ID of the Work Item you want to delete. Or, you can call witAdmin, including the full file path, avoiding setting the path environmental variable. True, you could simplify the above to a single line of code, but I feel using variables is easier to understand for readers then one long line of code. Administrating Team Foundation Server often involves repeating the same tasks over and over with only slight variation in the details. This is especially true if your team adheres to an Agile software development methodology. Every few weeks a new Iteration begins, which means inputting new Change Requests into Team Foundation Server along with their associated Tasks*. Repetition equals Automation equals PowerShell. If you have to repeat the same task in Windows more than a few times, consider automating it with PowerShell. Microsoft has done an outstanding job equipping PowerShell to access a majority of the functionary of their primary application; Team Foundation Server 2010 (TFS) is no exception. Microsoft’s latest release of Team Foundation Server Power Tools December 2011 includes Windows PowerShell Cmdlets for Visual Studio Team System Team Foundation Server. According to Microsoft, Power Tools are a set of enhancements, tools and command-line utilities that increase productivity of Team Foundation Server scenarios. 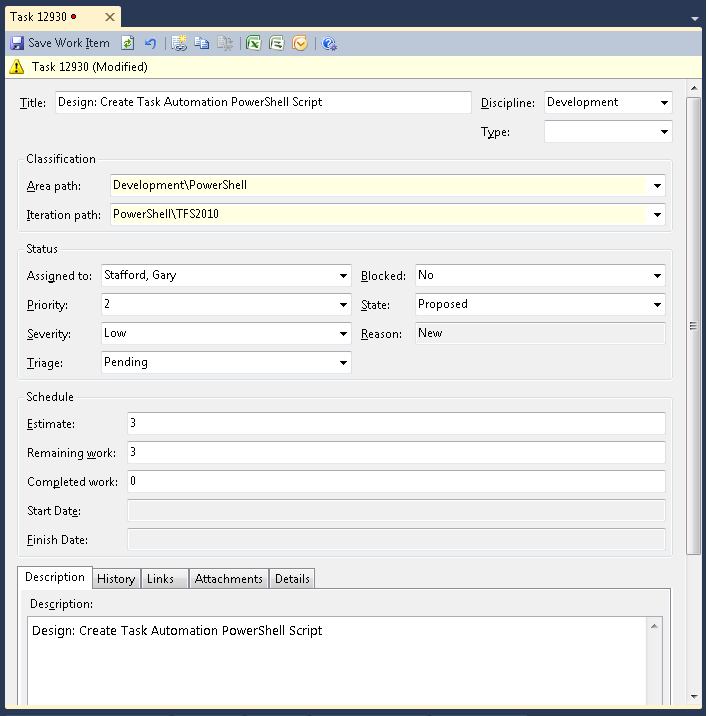 Power Tool’s TFS PowerShell Cmdlets give you control of common version control commands in TFS. One gotcha with TFS Power Tools, it doesn’t install PowerShell extras by default. Yes I agree, it makes no sense. If you already have Power Tools installed, you must rerun the installer, select the Modify Install option and add the PowerShell features. If you are installing Power Tools for the first time, make sure to select the Custom install option and add the PowerShell features. *Tasks are a type of TFS Work Item. Work Item types can also include Bugs, Defects, Test Cases, Risks, QoS Requirements, or whatever your teams decides to define as Work Items. There is a comprehensive explanation of Work Items in chapter 12 of Microsoft’s Patterns & Practices, available to review on Codeplex. Working with different teams during my career that practice SCRUM, a variation of Agile, we usually start a new Sprint (Iteration) ever four to six weeks with an average Sprint Backlog of 15-25 items. Each item in the backlog translates into individual CRs in TFS. Each CR has several boilerplate Tasks associated with them. Many Tasks are common to all Change Requests (CR). Common Tasks often include analysis, design, coding, unit testing, and administration. Nothing is more mind-numbing as a Manager than having to input a hundred or more Tasks into TFS every few weeks, with each Task requiring an average of ten or more fields of data. In addition to the time requirement, there is the opportunity for human error. The following PowerShell script creates a series of five different Tasks for a specific CR, which has been previously created in TFS. Once the Tasks are created, I use a separate method to link the Tasks to the CR. Every team’s development methodologies are different; ever team’s use of TFS is different. Don’t get hung up on exactly which fields I’ve chosen to populate. Your processes will undoubtedly require different fields. There are many fields in a Work Item template that can be populated with data, using PowerShell. Understanding each field’s definition – name, data type, and rules for use (range of input values, required field, etc.) is essential. To review the field definitions, in Visual Studio 2010, select the Tools tab -> Process Editor -> Work Item Types -> Open WIT from Server. Select your Work Item Template (WIT) from the list of available templates. The template you chose will be the same template defined in the PowerShell script, with the variable $workItemType. To change the fields, you will need the necessary TFS privileges. When developing the script for this article, I was stuck for a number of hours with a generic error (shown below) on some of the Tasks the script tried to create – “…Work Item is not ready to save” I tried repeatedly debugging and altering the script to resolve the error without luck. An end up the error was not in the script, but in my lack of understanding of the Task Work Item Template (WIT) and its field definitions. By trial and error, I discovered this error usually means that either the data being input into a field is invalid based on the field’s definition, or that a required field failed to have data input for it. Both were true in my case at different points in the development of the script. First, I failed to include the Completed Time field, which was a required field in our Task template. Secondly, I tried to set the Priority of the Tasks to a number between 1 and 5. Unbeknownst to me, the existing Task template only allowed values between 1 and 3. The best way to solve these types of errors is to create a new Task in TFS, and try inputting the same data as you tried to inject with the script. The cause of the error should quickly become clear. For simplicity sake I have presented a simple PowerShell script. The script could easily be optimized by wrapping the logic into a function with input parameters, further automating the process. I’ve placed a lot of comments in the script to explain what each part does, and help make customization easier.The script explicitly declares all variables and adheres to PowerShell’s Strict Mode (Set-StrictMode -Version 2.0). I feel this makes the script easier to understand and reduces the number of runtime errors. #              Work Items in TFS for a given Change Request. [string] $changeRequestName = "Create Task Automation PowerShell Script"
[string] $assignee = "Stafford, Gary"
$fields += "Estimate=$($taskEstimateArray[$i]);Remaining Work=$($taskRemainingArray[$i]);Completed Work=$($tasktaskCompletedArray[$i])"
Open the Visual Studio 2010 Command Prompt. 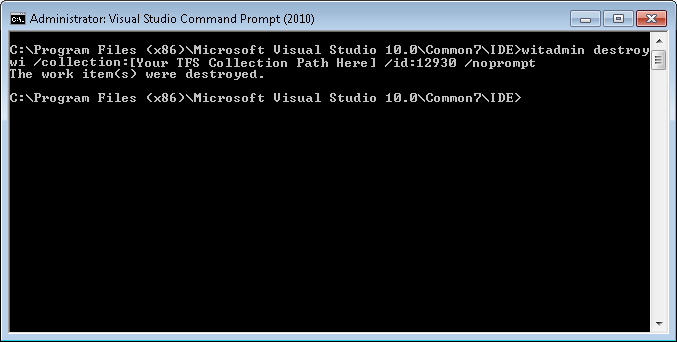 C:\Program Files (x86)\Microsoft Visual Studio 10.0\Common7\IDE. Almost the same command can be run in PowerShell by including the path to witadmin.exe in the script. I found this method at Goshoom.NET Dev Blog. You can read more, there. Be warned, there is no undoing the delete command. The noprompt is optional; using it speeds up the deletion of Tasks. However, leaving out noprompt means you are given a chance to confirm the Task’s deletion. Not a bad idea when you’re busy doing a dozen other things. Creating Tasks with PowerShell, I save at least two hours of time each Sprint cycle, and greatly reduce my chance for errors. Beyond Tasks, there are many more mundane TFS-related chores that can be automated using PowerShell. These chores include bulk import of CRs and Tasks from Excel or other Project Management programs, creating and distributing Agile reports, and turnover and release management automation, to name but a few. I’ll explore some of these topics in future blog.